There has been a pub on this site since 1786, making it one of Manchester’s oldest drinking establishments. We’ve worked hard to preserve and protect our heritage and history, resulting in an authentic, Victorian style British pub. Our pub has won awards both national and regional for quality of beer. No televisions and no background music; just great beer, great food and great conversations; this is a real, traditional pub as we believe it should be. Care and quality runs through every aspect of our pub, whether it’s our food or the fun and undeniable entertainment on offer at our famous (or infamous) pub quiz. We serve great food all day, and are well known for our sri lankan curry or steak and ale pies. Whether it is food, drink or service, our team are passionate about this great old pub, and will guarantee you soon feel the same. 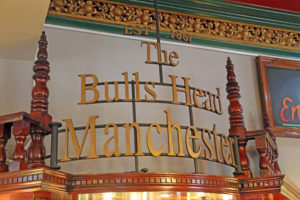 So visit the Bulls Head, for great food, great beer, great laughs, real pub character, and a famously warm welcome.